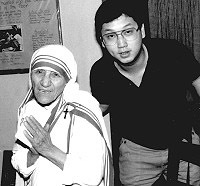 Mother Teresa and young Joseph Lam met in 1982 in Calcutta, India. He witnessed first hand her touching work to help the poorest of the poor in the streets. Joseph participated in several of her feeding projects. This experience with Mother Teresa so impacted him that he was even more inspired to devote his life to serving others. 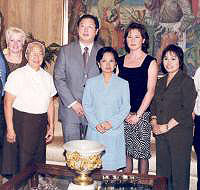 President of the Philippines, Gloria Macapagal-Arroyo (center) invited Dr. Joseph Lam to the Malacanang Palace in 1997 for special acknowledgment of Dr. Lam's charitable contributions to the Missionaries of the Poor outreaches which aid the needy and TB stricken children of the Philippines. Former U.S. President Bill Clinton meets with Dr. Joseph Lam at Dr. Lam's home church in San Jose, California, Jubilee Christian Center, during a united fundraising effort in 2001 to send relief aid to help rebuild the lives of victims of the tragic Gujarat, India earthquake. 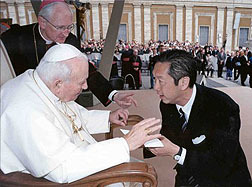 Pope John Paul meeting with Dr. Joseph Lam at St. Peter's Square in 2003. The Pope gave his blessing to Dr. Lam for his contributions on behalf of the Vatican Children's Fund. 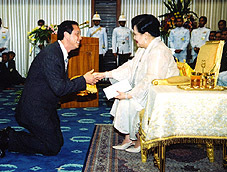 Royal Audience: Her majesty, Queen Sirikit of Thailand, is shown receiving a special grant from Dr. Joseph Lam in June, 2004 to help the needy Thai children. The Queen expressed the deep appreciation of the Thai people for the work that Dr. Lam has been doing to help rescue children from exploitation and abuse in Phuket, Bangkok and northern Thailand. 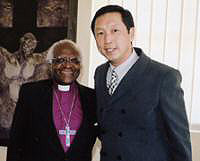 Bishop Desmond Tutu, Nobel Peace Prize winner, Archbishop Emeritus met with Dr. Joseph Lam in June, 2005. Bishop Tutu expressed his appreciation for Dr. Lam's "Operation Africa Child" mission in Capetown, South Africa that provides on-going relief assistance to suffering, needy South African children. Billy Graham, perhaps the world's most honored and respected evangelist, met with Dr. Joseph Lam in May, 2006, at his Montreat residence in North Carolina in conjunction with an American Bible Society event that awarded Dr. Graham a "Lifetime Achievement Award." 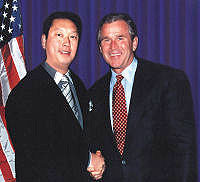 With U.S. President George W. Bush, Dr. Lam pledges aid to help innocent child victims of terrorism. 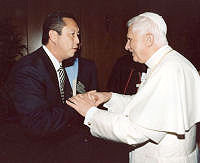 Pope Benedict XVI received Dr. Joseph Lam at a private audience at the Vatican in October, 2005 in regard to Dr. Lam's philanthropic and humanitarian charitable services for needy children and their families throughout the world. 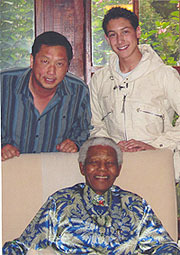 Nelson Mandela, former President of South Africa, in June 2006, invited Joseph Lam and his son Stephen Lam to meet with him at his home in South Africa to discuss the continuing needs of suffering children and those with AIDS in that nation. June 17, 2009 in Moscow: Former Russian President Mikhail Gorbachev met with Dr. Joseph Lam, Mr. Gorbachev oversees the Raisa Gorbachev Foundation Charity (his late wife), which is dedicated to the treatment and eradication of childhood cancer. Arun Gandhi, grandson of Mahatma Gandhi, consults with Dr. Joseph Lam in June, 2009, in regard to their efforts to further humanitarian relief programs for needy Third World countries in accordance with the merciful legacy of Mahatma Gandhi. 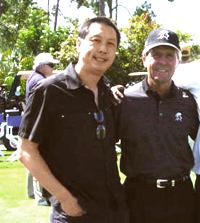 Joseph Lam meets with world famed golfer and humanitarian,Gary Player, at the Nelson Mandela Charity Golf Classic tournament in Miami, Florida-- March, 2004. 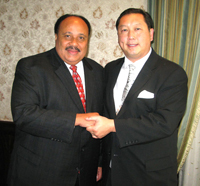 Dr. Martin Luther King, III, met with Dr. Joseph Lam in Atlanta, Georgia, October, 2009, regarding charitable projects which will benefit noble humanitarian causes throughout the world and which will further honor the legacy of Dr. King’s father—the late Dr. Martin Luther King, Jr.